For a book about another main character who is more of a “quiet listener,” read “The Perks of Being a Wallflower” by Stephen Chbosky. For another story about a man who discovers meaning in his life through a woman who challenges him, try “The Woman Who Wouldn’t” or “My Little French Whore” by Gene Wilder. “Alaska” mentions “the only real geniuses are artists” and list a few authors. Some of her recommendations were Yeats, Kurt Vonnegut, and Garcia Marquez. Preheat oven to 350°F. Combine spice cake mix with eggs, buttermilk, oil and sour cream. Mix on medium speed just until combined. Add vanilla extract, cinnamon, nutmeg and brown sugar, continue mixing until incorporated. Line a muffin pan with cupcake liners and fill each one 2/3 full of batter. Bake at 350° for 15-18 minutes. Check for doneness by inserting a toothpick in the middle of the cupcake. If the toothpick comes out clean, your cupcakes are done. Allow cupcakes to cool for five minutes before transferring to a wire rack and cool completely before frosting. 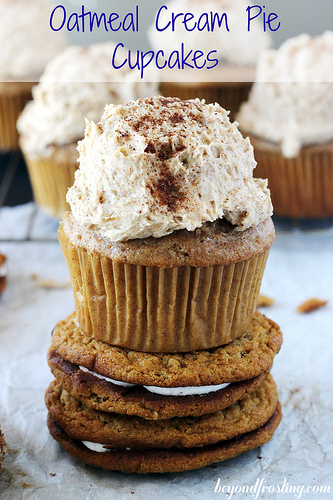 To prepare the frosting, start by grinding up the Oatmeal Cream Pies using a food processor to grind into a small crumbs. Set aside. Allow butter to come to room temperature enough for it to be slightly softened but not melted. Whip butter in mixer using the paddle attachment for several minutes until butter is smooth and creamed. Add jar of marshmallow fluff and beat into butter until well combined. Mix vanilla extract into butter and fluff combination. Pour powdered sugar into mixing bowl two cups at a time, mixing well after each addition. I used five cups for my frosting to make it a little stiffer. Add heavy whipping cream and beat into the frosting. This helps to add to the creaminess of the frosting while cutting down the sweetness from the powdered sugar and marshmallow fluff. Lastly, added the cinnamon and a pinch of salt. Once mixed in, add the Oatmeal Cream Pie Crumbs and beat on low until incorporated. I also chose a drink for this recipe, not only because a lot of drinking occurred during this book, but also to honor the name of Alaska’s car, Blue Citrus, and her memory. or over ice. Garnish with an orange slice. 1. Have you ever been at a point where you were seeking “a Great Perhaps” in your life? When was it for Miles? For you? What do you think that phrase meant to him at the beginning of the book versus the end? 2. IS it true that everyone has a talent? What are your unique gifts? Are there any odd ones you’ve seen in person or in a movie (think Breakfast Club) that made an impression on you? Which might make an impression on Miles, the Colonel, or Alaska? 3. Is the labyrinth living or dying to Miles/ Pudge at the beginning of the book? What about at the end? And what is it for you, or is there one at all? 4. Have you ever experienced “the fear and excitement of living in a place where you never know what’s going to happen or when?” Where was it? What made it like that? 5. What does it say about Pudge that he hates discussion classes and prefers lecture style? Which did you prefer in school/college? Why? 6. Alaska was allowed to choose her own name. Based on its meaning “that which the sea breaks against,” do you think it was an apt name for her? Are there any names that come to mind that might fit her better? Why? What would you have named yourself given the choice? 7. Alaska talks about Pudge, and others, using the future to escape the present. Is this true of him? What was she escaping? So was she truly living in the present either? Were any of them, or us? And is that something we should aspire to do? 9. The passion and the love for what she was reading made Pudge enjoy books in a way he never had before. Did you ever have a teacher, a parent, or anyone in your life that became so alive talking about a book, or reading it to you, that it made you like it in spite of yourself? 10. Do you agree that Alaska was right, that Bolivar’s last words were about the labyrinth of suffering, not life or death? Why would those be his last words then, or did he know the end was near? Is everyone struggling with suffering of some kind, at one point or another? 11. The Colonel insisted that the Weekday Warriors loved their hair because they weren’t “smart enough to love something more interesting.” Do you think this could be true of them, or of any of their other possessions? Is it ever true of those of us in privileged, first world countries? What makes that change for some people? 12. Alaska loved Auden’s line “You shall love your crooked neighbor with your crooked heart.” Do you think Pudge couldn’t understand it because he had never really loved anyone before, or because he didn’t understand the crookedness of his own heart? Why and how does this affect the way we love, and why did that mean so much to Alaska? Was she trying to warn him about herself? 13. After they had hatched and were carrying out the plan, Pudge says “The great Perhaps was upon us, and we were invincible.” How does this compare to the line “I swear, we were infinite” in “The Perks of Being a Wallflower”? Have you ever had a moment like that? What happened? 14. What were some of the most comical moments in the book for you? Pudge’s first b.a. moment? The Swan? 15. Whose best day/worst day stories did you like best? Why? How does it compare to the same game played in the movie “City Slickers”? Have you ever played it with friends, or would you all be willing to try it now? 16. Have you ever been so overcome with sorrow or guilt that you just began heaving? Which do you think was more powerful for Miles, the sorrow or guilt? Why? 17. Were Pudge and the colonel just comfort eating with the oatmeal cream pies and excessive bufriedos? Or did either of these foods hold deeper significance, perhaps because of Alaska’s preferences for them? What causes people to look to food as comfort in sorrow or distress? 18. Do you think Alaska really meant it when she told Pudge, “To be continued?” Or did something change for her during the course of her drive? 19. Is the hardest part about death the fact that we continue to love that person, present tense, as Miles, Takumi, Chip, and Lara did? If not, what is? What made her death the hardest on Miles, or was it? 20. Do you feel the senior prank was an appropriate one for Alaska? What would you have planned for yours (or theirs), or did you do one with your senior class?